Go-Kart Manacha, Vosges - Chalet in the Vosges with view. Chalet in the Vosges with view. 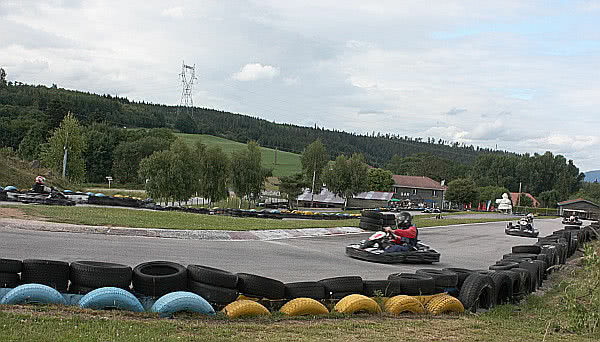 Manacha Kart is situated between Anould and Gerardmer. 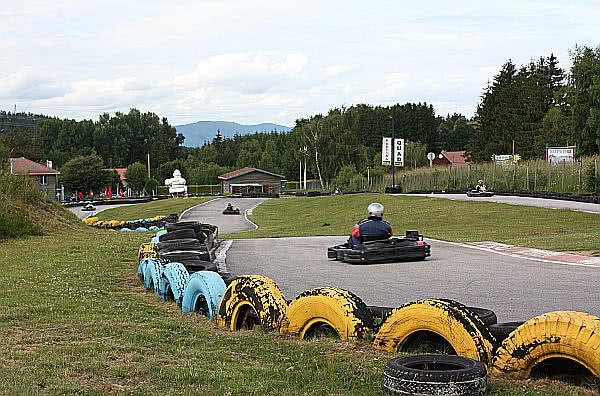 A go-kart track in Lorraine. Location and size of the go-kart track. Go-Kart Manacha is an outdoor track at the Col du Plafond. Approximately in the middle of the photo from left to right, the road D8 runs from Anould to Gerardmer. Furthermore, you can see in the foreground the rural road D60, which leads from the crossover to the Col du Plafond to the village Corcieux. The total view of the Manacha Kart track taken from a larger distance. The track goes from the left to the right edge of the picture. Consequently, just visible to the right, the extreme end. The length is about 600 metres. In addition, parking is on the left of the building, representing the reception of Manacha Kart. There are bars and a pizzeria in Manacha Kart Building. It is open every day. The respective opening hours can be found on the website of Manacha Kart, which is always well visited. The name of the site will remain uncertain. Was it the beautiful sound of the word “Manacha” the starting point? Also a conceivable option is the city Manacha in Yemen, which lies on the road from the capital Sanaa to Al Hudaydah on the Red Sea. Or is there a different context? The name giver only itself can answer this question, for us the name remains in the dark. The word “kart” comes from the English “cart”. “Cart” has the meaning of wagon. The kart was originally a soap box, in which a lawn mower engine was installed. Soon after, there was a rapid rise in the favour of the young enthusiasts. Some racers began with karting, for example, the two Schumacher brothers, Prost or Vettel. Racing sentiments and the smell of gasoline in Gerbepal. Soon it goes into the curve, so please slow down slightly. The length of the track is sufficiently, so that braking and acceleration can be practised. Here it may be accelerated, the best way to find out, what’s possible with a kart with its six horsepower. But do not worry, it will not be too fast. They have go-karts for children from eight years onwards, but also karts for adults. Furthermore, there are two-seater karts for an adult and a child. By German standards, Manacha is a rather small go-kart track. The longest indoor kart track in the world is about 1600 meters long and located in Dortmund. Wackersdorf has anyway an outdoor track with still 1222 meters. The prices of these tracks are very moderate. All in all, the Manacha kart track is for those who like to taste racing air and for those who have gasoline in the blood at least great experience. Swimming Lake Longemer in the Vosges. Saboterie, fabrication of wooden clogs. Make your reservation now !